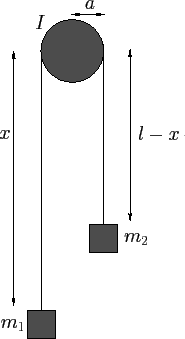 An Atwood machine consists of two weights, of mass and , connected by a light inextensible cord of length , which passes over a pulley of radius , and moment of inertia . See Figure 32. Figure 32: An Atwood machine. Figure 33: A double Atwood machine. Consider the dynamical system drawn in Figure 33. This is an Atwood machine in which one of the weights has been replaced by a second Atwood machine with a cord of length . The system now has two degrees of freedom, and its instantaneous position is specified by the two coordinates and , as shown. The accelerations and can be obtained from the above two equations via simple algebra.